This is a story we are surprised to read in the Old Testament. We remember that Jesus twice fed multitudes with a few loaves and fish (Matthew 14:13-21 and 15:32-39). We forget that God used Elisha to do a similar miracle hundreds of years before. Just like in John 6:9, they had relatively few loaves of barley bread to feed many. Barley was always regarded as simple food, better for feeding animals than people. In the Talmud, one man says, “there is a fine crop of barley” and another man answers, “tell it to the horses and donkeys.” Humble barley loaves aren’t much to work with, but God doesn’t need much. By God’s miracle, few loaves were made many and they had more than enough. It says, “they ate and had some left over,” and it was all according to the word of the LORD.” God promised more than provision, but to provide beyondthe immediate need. Elisha trusted the promise of God, acted upon it, and saw the promise miraculously fulfilled. Notice that here in 2 Kings it was 20 loaves for about 100 people. 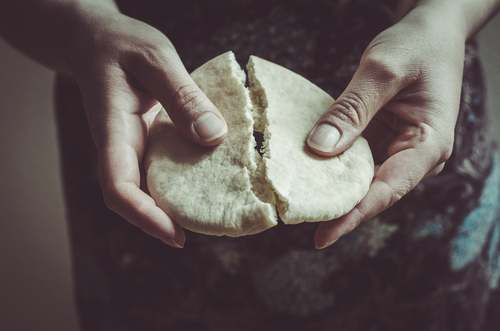 In the ministry of Jesus, it was 5 loaves for 5,000 people! In 2 Kings there was some left over, but in the ministry of Jesus they filled 12 big baskets with the leftovers (John 6:13). Though God did a wonderful work through Elisha, it was just a preview of a much greater work God would do in and through the true bread from heaven, Jesus Christ. Learn from what God did in the Old Testament through great prophets like Elisha. But make sure you look to Jesus with the eye of faith. Jesus is greater than all the Old Testament men and women of faith, and He is the One to Whom they all pointed.